Public Speaking: Finding Your Voice helps students develop into effective speakers while emphasizing the ethical significance of public speaking and its importance in our increasingly diverse society. Authors Kathleen J. Turner, Randall Osborn, Michael Osborn, and Suzanne Osborn guide students to become better, more thoughtful consumers as well as producers of messages — all the more important in an age when we are daily bombarded with “fake news” and other forms of deceptive communication. The 11th Edition includes fully updated examples as well as revised learning outcomes that help keep students on track in the course. 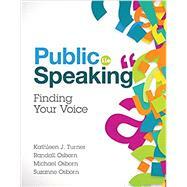 Public Speaking: Finding Your Voice, 11th Edition is also available via Revel™, an interactive learning environment that enables students to read, practice, and study in one continuous experience. Kathleen J. Turner is Director and Professor of Communication Studies and Director of Oral Communication at Davidson College, where she founded the Speaking Center. She also taught at Denison University, Notre Dame, the University of Tulsa, Tulane, and Queens University of Charlotte, where she was the inaugural Knight-Crane Professor. She served as President of the National Communication Association in its centennial year of 2014. She has received the Ecroyd Award for Outstanding Teaching in Higher Education from the National Communication Association, the Michael Osborn Teacher-Scholar Award from the Southern States Communication Association, and the Faculty Award from Davidson’s Student Government Association. A rhetorical analyst, she studies communication as a process of social influence, particularly concerning media, politics, popular culture, and women’s issues. Publications include Lyndon Johnson's Dual War: Vietnam and the Press (University of Chicago) and Doing Rhetorical History: Concepts and Cases (edited, University of Alabama). She has also written numerous articles, essays, and book chapters on such subjects as sixties protest music, presidential libraries, the rhetorical analysis of movies, musical and visual invention in television programs, the future of rhetorical studies, comic strips, and the history of product placement. Randall Osborn has been teaching classes in rhetoric and public speaking for over twenty years. He received his PhD in Speech Communication from Indiana University in 2003, and his research interests lie in political communication and the intersection between racial identification and the rhetorical construction of a new south. He has taught public speaking and other courses at the University of Arkansas, Indiana University, and Dyersburg State Community College, and has held professorships at Indiana University South Bend, the University of Nevada, Las Vegas, and the University of Memphis. In 1996, he was awarded the Indiana Speech Tradition Award for Excellence in Teaching Public Speaking. He currently teaches courses in oral communication at the University of Memphis. Michael Osborn is Professor Emeritus at the University of Memphis, retiring in 1995 after 30 years as professor and department chair at the University. He had taught previously at American University and the University of Iowa, where he returned some years later to teach a seminar as the A. Craig Baird Distinguished Visiting Professor. He also served as visiting professor at the Universities of North Carolina, California-Davis, Indiana, Louisiana State, New Mexico, and Vanderbilt. He served as president of the Southern States Communication Association and of the National Communication Association, and received the distinguished service awards from both organizations. He also served as chair of the board of Humanities Tennessee, on which he sat for many years as an appointee of the governor. In 1970 he was the nominee of the Democratic Party for the U. S. House of Representatives from Tennessee’s Ninth District. His research has been recognized by the NCA’s Golden Anniversary Monograph Award, the Charles H. Woolbert Award for research of enduring influence, and the Ehninger Award for sustained work in an area of rhetorical study. The Osborn Award is presented annually by SSCA recognizing a career in the Southern region balanced among outstanding contributions to scholarship, teaching and service. Dr. Suzanne Osborn received her BA degree in speech from West Virginia University, her MA in speech from the University of Florida, and her PhD in psychology from the University of Memphis. She has had a varied teaching career teaching in the departments of Theatre and Communication Arts, Psychology, and Management at the University of Memphis; the departments of Humanities and Literature and Languages at Christian Brothers University; the department of Marketing and Management at the University of North Alabama; the department of Theatre and Media Arts at Rhodes College; and the department of Management at State Technical Institute at Memphis. She has also been a visiting professor in speech communication at the University of Indiana, the University of California-Davis, the University of New Mexico, and Vanderbilt University. She has been a guest lecturer at the University of Massachusetts, Northeast Missouri State University, and Northwest Mississippi Community College. She has also been a consultant and lecturer on instructor training at Penn State University, the University of Pittsburgh, the University of South Carolina, Texas A & M University, Oregon State University, Dekalb College, and Johnson & Wales University. In addition to her teaching Suzanne Osborn has worked as an organizational psychologist with the City of Memphis, Memphis Light Gas and Water Utilities, and First Tennessee National Bank Corporation. She has also worked with organizational consulting firms servicing such clients as the Kettering Foundation, BASF Wyandotte, and Federal Express.